Perhaps one of the most amazing aspects of being a wedding venue in Los Angeles is the variety of cultures that come through our doors on a weekly basis. It’s given us a wonderful glimpse of how different and beautiful celebrations are everywhere around the world. One of our favorite types of weddings to host at Imperial Event Venue are those for our Chinese clients. 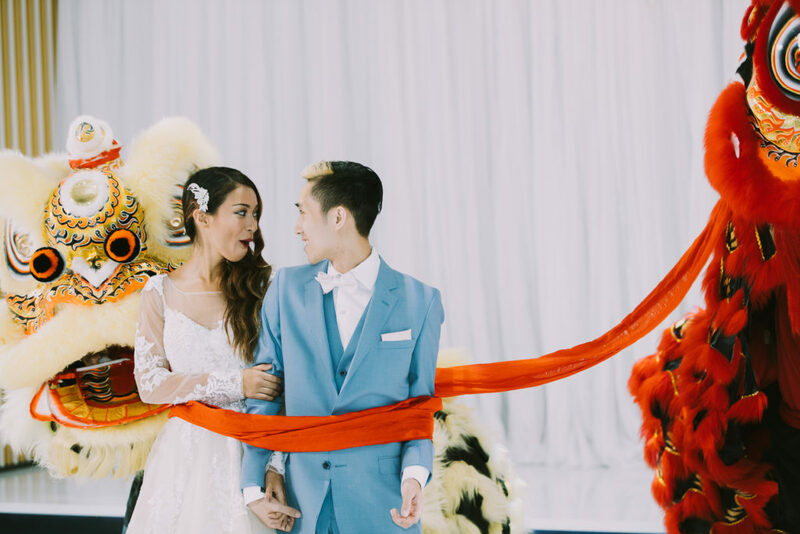 These weddings are filled with incredible catering, gorgeous colors and decorations, and often times we get to enjoy a Chinese lion dance, which is an important part of the culture. So why is it so important? Let’s find out. The art of dancing with masks that mimic the faces of animals didn’t exactly begin with the lion dance. Before its time, there were myths in China of dancers wearing masks of fish, dragons, and phoenixes. Since lions were not native to China at the time, there are some suggestions that it may have influence from either India or Persia. The myths suggest that rulers from Persia sent lions as gifts to Chinese rulers. The time of the Tang Dynasty is where we see recordings of various lion dances. There are stories of a lion dance called the “Great Peace Music” in the Tang court. The dance consisted of five large lions in different colors, all expressing various moods. There are several variations of the Chinese lion dance, depending on what province you’re in, and whether you are in the north and south. The lions in each region all have a very distinct look compared to one another. The northern lion tends to resemble the Pekingese dog, and during the dance the movements are very lifelike. The dance consists of many acrobatic movements and stunts, which may including balancing on a ball. 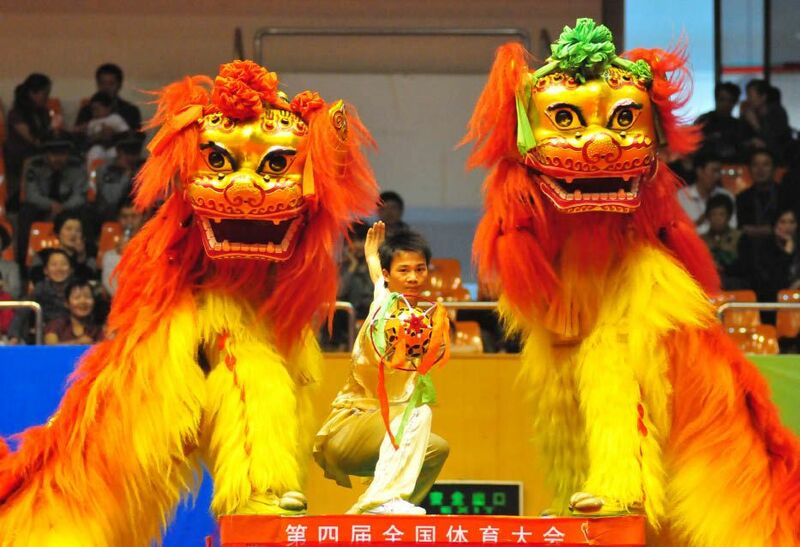 Usually the northern Chinese lion dance is performed by a pair of male and female lions. They’re usually decorated with orange hair, with a red bow to indicate that it’s a male and a green bow to indicate it’s a female. The two main styles of lion in southern China are the Fut San and the Hok San. Both originated in Guangdong, and may also be referred to as the Cantonese lion. The southern lion traditionally has a single horn on its head, and is usually constructed out of papier-mâché over a bamboo or aluminum frame. The two styles of southern lion vary in their movements and dance. Fut San lions embrace powerful moves which have derived from kung fu. Hok San lions are known for unique footwork as well as rich expressions. Why Have The Chinese Lion Dance At A Wedding? 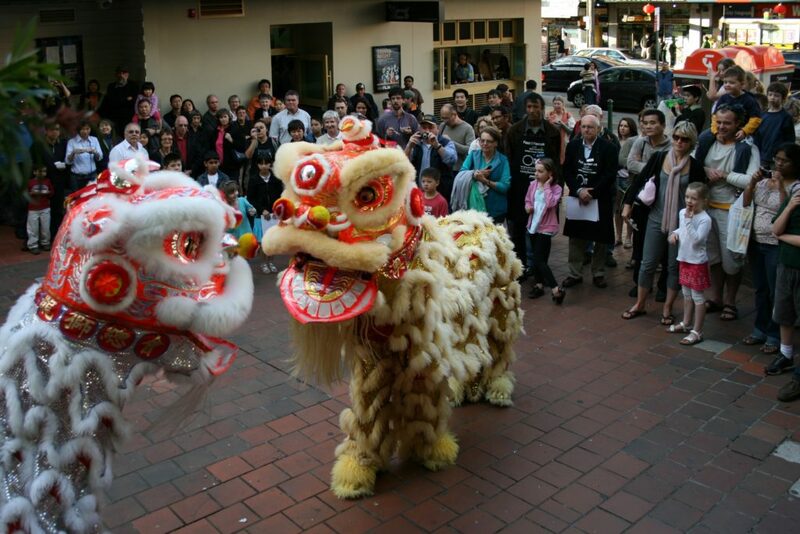 The Chinese lion dance is performed at a variety of occasions, but most notably during Chinese New Year. This dance can also be performed at special occasions, cultural and religious festivals, grand openings for new businesses, and to honor specials guests. The Chinese lion dance is performed at weddings to bless the couple in order for them to have a long and happy marriage. It is also said to help ward off evil spirits from being detrimental to their life together. Other blessings that the Chinese lion dance brings to the couple is fertility, overwhelming growth, prosperity, and a wish for longevity. Why Should We Have A Chinese Lion Dance? The simple answer, of course, is to experience the culture that you’ve grown up with. There’s something to be said about having traditional elements of your culture added to your wedding day. 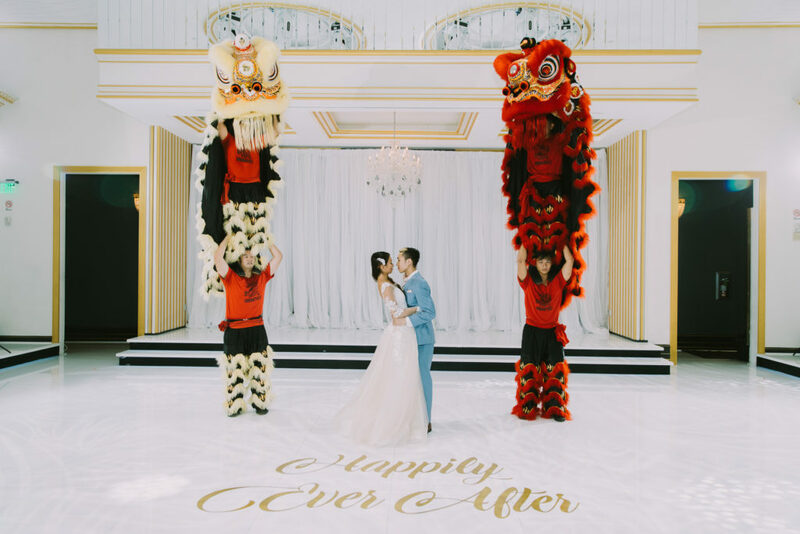 Along with incorporating a sense of tradition into your wedding, the Chinese lion dance a great way to add fun. Your guests will be entertained by the beautiful dance, which usually lasts about 15 to 20 minutes (depending on which performers you decide to hire). 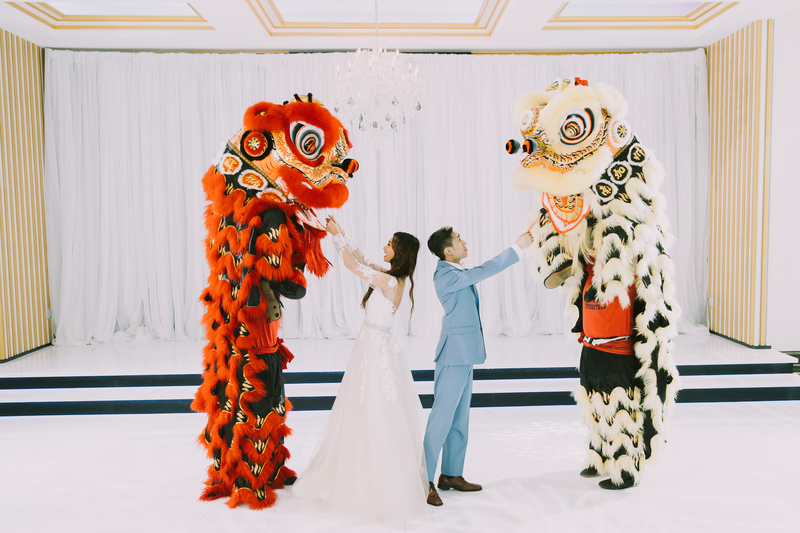 Make sure when deciding to hire a Chinese lion dance for your wedding that you try and schedule them two to four months in advance, as they are becoming increasingly popular.